It is time that you put your flour sack towels to creative work instead of using them only in the kitchen. We bet that you have a number of sack towels sitting around in your kitchen drawers that you are not exactly sure what to do with. They are versatile, like a kitchen workhorse and great for a variety of DIY projects. People have even started cutting back on paper products used in the kitchen and are switching to flour sacks in their daily routine. Check out these creative 10 DIY ideas for flour sack towels now. 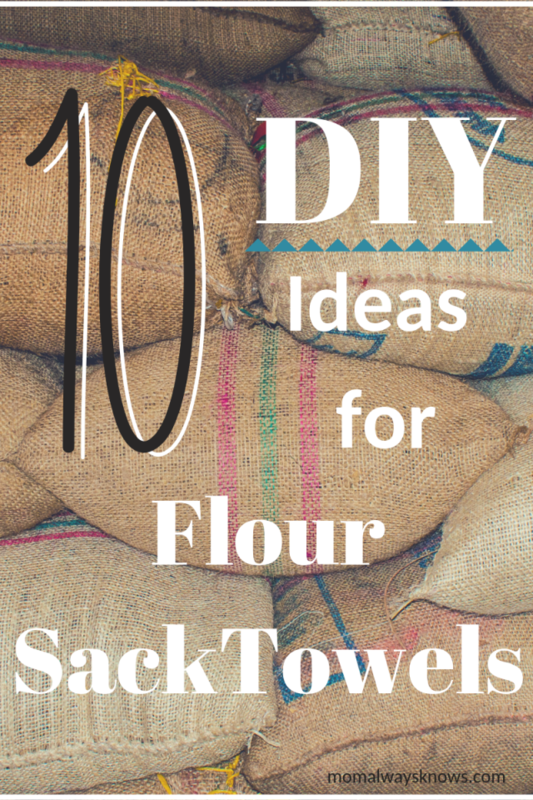 Here are 10 DIY ideas for flour sack towels! They can be costly and you may not always find them in accordance with the color and patterns of your table and interior. You can now make your own table mats using flour sack towels. Get a pack of six with a few more supplies such as a seam ripper, a sewing machine, and scissors; work them out together, and there you are with stunning, handcrafted place mats. You can also display pretty flour sack towel in your family room or bedroom. All you need is two sack towels, a sewing machine and pins to make beautiful hoaxes for toss pillows. They can also be a perfect size for boudoir pillows. This one is surely an out of the box use of a flour sack towel! You can turn these towels into blinds for tiny windows, maybe those constructed in your kitchen or restroom. You can keep them as simple as hanging them on a string using safety pins. On the other hand, if your wall has a curtain rod fixed, you can make small holes along the corners of one edge of the towel and pass it through the rod. You can also stitch several sack towels together to make longer window curtains. If you want to add an instant appeal to your plain surfaces, then use flour sack towels as seat or couch arm covers, or transform them into doilies to place them on your dressing or side table. This will also help prevent dust buildup. If you have a knack for embroidery and stitching, then a flour sack towel may become your best friend. They can be turned into alluring craft pieces. Due to their resistance to disentangling, you can use them as a canvas for embroidery or cross-stitching, stretch them across a frame and hang it on a wall! Another quick hack is to use iron-on stickers. Using wrapping papers for gift wrapping is mainstream! How about going out of the box and using decorative sack towels to wrap wine, essential oils, fruits, and soaps? Everyone will love this gesture and appreciate your consideration. Later, these towels can be reused by the recipients for various other purposes. Fulfill your urge of craftiness – fold a flour sack towel in half and stitch it from three sides giving it a pocket shape. Now sew in drawstrings and turn it into a tote bag. What better use could there be than giving them away to old age homes or pet shelters? Caretakers there can use them as rags, bath or kitchen items, cage liners, and more. Got an injury and you do not have an ice pack? Worry no more! You can now make an instant ice pack by using a flour sack towel. Pack ice inside it and your pack is ready! We bet you never thought this far! Use a flour sack towel to make broom covers for wiping spider webs and residue in the high edges of the room, on roof fans, and at the back of furniture. Simply overlap the material into equal parts, put the ends of brush bristles in the crease, and tie the corners such that you tie the two corners on right and the other two on left. Once you are done cleaning, untie the corners and throw the towel in a washing machine. Wash your towels every few days and immediately if they have touched food. It is recommended to wash them in warm water – machine or hand wash is your choice. Also, avoid using fabric softener on a flour sack towel as it spoils the absorptive nature.